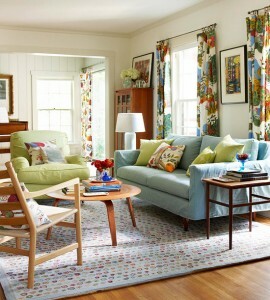 When money is tight, we tend to spend more time at home, so we want it to be a stylish and fun place to be. But how can you give your home a fresh look without breaking the bank? If HGTV and decorating magazines have taught us anything, it’s that we can makeover a room without spending a lot of money. There are plenty of ways to improve the look of your home without a big investment. Whether you’re looking for ways to put the finishing touches on your room or just wanting to refresh your space, here are a few tricks and some well-picked accessories for under $100 that can go a long way toward freshening up a room. Nothing can transform a room as quickly as a great coat of paint. Splashing some color on the walls can bring together all the elements in a room and refresh the look of any space. Better yet, you can get a couple of gallons of paint and supplies for less than $50. Liven up your space with light! An evenly lit room is boring — variations in brightness, highlight, and shadow make a room more interesting and livable. The key to a great design is a balance of task, accent, and general lighting that allow you to perform a variety of activities in one room. Displaying your favorite photos, painting or prints on the wall will dress up any room. Since so many of us have digital cameras now, it’s easy to forget to make prints of some of your favorites, but it only costs a few cents per print! For under $10, you can enlarge some of your favorites and make a great focal point on a wall with a collection of framed photos in various sizes. Similarly, it’s easy to find inexpensive artwork at Upscale Consignment– gather a few and display them together, and you’ve got a great-looking collection and conversation piece! No matter how simple an object may be by itself, a grouping in the same scale or color scheme gives a polished look to your collection. range from $15 to $99. Mirrors can liven up a space by bouncing more light around the room. Whether you buy one large mirror to hang above a fireplace or piece of furniture, or a few small ones in a pattern on the wall, mirrors add interest and depth to any room. Whether it’s a new quilt draped over the end of a bed or sofa or some new hand towels for the bathroom, new linens can quickly make a room feel new again. You can find a set of new hand towels or colorful blanket for under $20, and a complete set of incredibly fine bed sheets for under $75. Perhaps the cheapest way to improve your home is to simply get organized. High shelves and mantles are great for dressing up a space and cleaning up clutter from books, magazines and knick-knacks that don’t really have a good home. Dress up lower shelves with several matching baskets or boxes for papers, colors, toys, DVDs, and games. Use large baskets or bins in an unused corner to serve as a toy storehouse that is both quick access and easy pick-up. The best tip we can give is to have fun with your decorating. It’s your home, and no one has to love your choices but you. Don’t just buy things because they’re cheap – make sure you buy things you really love and that reflect your personality. If you find that you need to fill in a few pieces, don’t forget to check Upscale Consignment for a wide selection of lamps, artwork, mirrors and home decor, all at great prices. As always, we hope that you enjoy this post and find it helpful in restyling the place you live into the place you love!